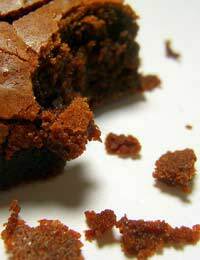 Chocolate brownies are wonderful – partly because they are so delicious but also because of their versatility. These tasty treats can be eaten as a snack with a cup of tea, wrapped and popped into pack lunchboxes or served as a dessert after dinner with a scoop of ice-cream. But best of all, if you are avoiding sugar you don’t necessarily have to avoid chocolate brownies! Try making your own sugar free varieties. These melt in the mouth sugar free brownies will disappear as soon as you’ve put them out on the cooling rack. Try serving them with some sliced fresh fruit in the summer or warmed, with a little whipped cream on the side, in winter. Begin by preheating your oven to 180ºC/350F/gas mark four. Then dig out a 30cm by 22cm baking tray and line it with greaseproof paper. Place your butter, cocoa powder and honey in a medium-sized bowl over a pan of simmering water and stir gently until melted. Beat your eggs in a separate bowl. Sieve your flour and baking powder in yet another bowl. Then remove the chocolate from the heat and quickly whiz in the eggs. Then fold your dry ingredients in slowly. Spoon your mixture into your baking tray and place in the centre of the oven. Baking should take approximately 20 minutes. The top of your brownies need to be firm to the touch but a skewer inserted in the middle needs to come out slightly sticky. Leave to cool on the side for a few minutes, then cut into squares and place on a rack. Serve either while still warm or eat at your leisure once cool. These delicious brownies have a few extra ingredients. Why not try them if you fancy a slight variation on the more traditional chocolate brownie recipe – something a little more luxurious perhaps? Sugar free fruit and nut brownies make particularly nice treats at Christmas. Three quarters of tsp baking powder. Once again, begin by preheating your oven to 180ºC/350F/gas mark four. Then take a 30cm by 22cm baking tray and line it with greaseproof paper. Cut your butter into pieces and place in a medium-sized heat proof dish along with 200g of your cocoa and honey. Boil water in a pan then place your bowl on top and stir until melted. Meanwhile, in a large bowl sieve your flour and baking powder. In a separate bowl beat your eggs. Remove your melted ingredients from the heat then quickly stir in your eggs. Fold in your flour and baking powder, then your cranberries and nuts. Spoon your mixture into your lined baking tray and position in the centre of the oven for about 20 minutes or so. It is important not to over-cook brownies. The top of your mixture needs to be firm to the touch and a skewer pushed in needs to come out slightly sticky - the mixture should seem not quite cooked in the very middle. When ready, remove from the oven and leave to cool on the side for a few minutes, then cut into squares and place on a rack. Once cool, sieve your remaining 40g of cocoa powder and dust your brownies lightly.